Since this site is named Decimal Time, I should mention the fact that 2010 October 10 (55479), or 10/10/10, is the tenth annual Powers of Ten Day, which is named after the 1968 short film that starts by looking at a picnic in Chicago and zooms out by a power of ten every ten seconds until reaching 100 million light years, then zooming down to 0.000001 ångstroms. 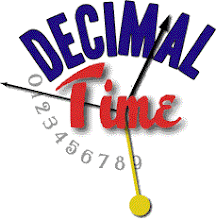 This is not to be confused with Decimal Day, which was when the UK converted to decimal currency on 15 February 1971 (40997). Also, the new jailbreak for iOS 4.1 (iPhone/iPad Touch/iPad/Apple TV) is scheduled for 10/10/10 at 10:10:10, presumably GMT (55479.423727). Unfortunately, it only works on the latest versions of these devices, but that's OK for me. Update: (55479.189) a different jailbreak has already been released, so the all-tens release probably won't happen now. Stardate Calculator by Priddy Software was released to the app store on August 10 (55409) and is free. It's very basic. Time and calendar date are displayed in a column with year, month, day, hour and minute broken out, and the stardate below, on a starry background. Tap on the calendar date, time or stardate to change them and convert. Both calendar date and time have a button for "today". However, the displayed time is two hours off from the time I pick, probably because the developer is in the US Central Time Zone. It should use either the user's local time or Greenwich (and make clear if it's the latter) rather than Illinois time. The "i" button just brings up ads for other apps, including several fart apps, but at least there are no ads on the front page, which is good for a free app. They should put some information about stardates, and the method they use to generate them. The current stardate is -311636.5, which I can tell uses the same method as the "twenty-fourth century stardates" calculated by TrekGuide.com. They start from 2322 May 25 (169296) as 0.0 and increment by 1000.0 every 365.25 days. Since this date is in the future, contemporary stardates are negative. Thus, this app is fine if you want to convert between stardates and calendar dates used in the 24th century, as on The Next Generation (TNG), Deep Space 9 (DS9) or Voyager, (VOY) but not very satisfactory for earlier centuries, as on the original series (TOS) or right now. I have mentioned the other two stardate apps previously on this blog. StarDate Calculator Pro sounds like a paid version of the above app, but is actually free and made by David Frick, aka Triangle Powers Software. It's even simpler than the above app. It starts out with the current stardate, which is now 64214.9, even though the calendar date always shows "September 26 2009" (55100) when it first loads. You can convert from any Gregorian calendar date to a stardate, but not vice versa. This app does not give correct stardates for future centuries when the TV series and movies take place, but it does provide a good approximation of the stardates given in episodes of TNG/DS9/VOY according to when they first aired on television. The app apparently uses the TrekGuide.com formula for "contemporary dates in The Next Generation Stardate format", which starts with 0.0 on 1946 July 15 and increments by 1000.0 every year. This gives satisfactory-looking stardates for the current era, if not for future ones. iStardate by Max Soderstrom/SusaSoftX was updated to version 1.1 on 2010 July 19 (55396) and costs 99 cents. As before, it loads with a starry field overlaid with the current stardate, which appears right now as [-28]3770.31. But now when you tap it, a "convert" button appears, allowing you to convert any Gregorian calendar date. It increments automatically, like a clock, 0.01 stardates every 2 or 3 minutes, or 5.00 per day. The "i" button gives a brief explanation, which really does not explain anything. iStardate uses the method from Andrew Main's FAQ, which is my least favorite. Basically, he has stardates rolling over from 9999.99 to 0000.00 every five-and-a-half years, then incrementing the "issue" number in brackets. They start from 0000.0 in 2162, right after the Federation will be founded, with negative issues before that, with the current one being [-28]. According to the FAQ, after 2269 several different methods will be used, in order to correspond with the stardates used in the various TV shows and movies, but the app continues using the same formula for these periods. So the app gives incorrect stardates in the future centuries, and ugly ones in ours. Even though this method was also adopted by Google Calendar, I cannot stand these stardates. You may wonder what the numbers that look like stardates are that I have after Gregorian dates. These are Modified Julian Day numbers, which have been used by astronomers for over a half-century to date star observations, and which are a modification of the Julian Days used since the 19th century. Just add a decimal and they become Julian Dates. Update: (55472.572) I forgot to include the latest version of New Clocks, which shows a current stardate similar to Triangle Power Software's app. Update: (56144.078) Sternzeit by Sebastian Bothe uses TNG stardates with January 1, 2323, as the epoch, so that stardates for the present period are large, negative numbers, slightly different from Priddy's Stardate Calculator app. Priddy's app is the only one that let's you enter a time when converting to stardates. Triangle's Stardate Calculator Pro no longer seems to be available in the appstore.